Wasabi mayo sounds yummy! I'm not a fan of mayo but I love wasabi so that might seal the deal :) I haven't made my pancakes in a while but I remembered to make them this morning! yum! Those look so good. Here's an internet confession - I'm not a big fan of fish. But, I've never even had salmon. I think that will be my August resolution - try salmon. Do you buy it at the grocery store? And what do you look for? When I met hubby, he didn't like fish either. One thing that helped him to like fish more was lots of lemon juice. I make a baked salmon dish and let the salmon sit in the fridge for a few hours in lemon juice, dill, salt, and pepper. Then I just bake it for about 15 minutes at 350 degrees. I make sure to buy wild salmon. It's available at my grocery store, but they have usually more farmed salmon, which is cheaper but not as good for you because of what it is fed. Farmed salmon is also not very good for the environment. Andrea, those look SO GOOD! I love any sort of cake, be it crab or salmon or tuna or whatever- yum! I also absolutely adore salmon...it's one fish my husband will willingly eat, too. Thank you so much for sharing this recipe...I'm going to put it in my file of things to try in the near future! Thanks for the shout out, Andrea. And you remembered to take pictures! I'm definitely going to try the wasabi version. I love sharing recipes and seeing the unique touches others give to them. I used to make chili loaded w/ veggies, ground turkey breast and lager but now w/ the girls I don't make it for fear of the spice. I could always make a mild pot, couldn't it? Every year at this time I start to look forward to the fall/winter: the weather, the holidays and the cozy, warm food. Then in March, I feel the same (expect I look forward to fresh fruit and sunshine ;-). I guess most of us are like that, no? Did you know I can't eat salmon, fish or just about ANYTHING without TJ's wasabi Mayo? I probably crave that more than those lemon cupcakes! I am THRILLED someone else does this ! I have learned I crave salmon becasue I am really wanting wasabi! I dip artichoke in it, eat it on toast with avocado, SALMON..(of course)it's becoming compulsive! to all your readers....if you haven't given this mayo a try (and you like wasabi of course) TRY IT! the "other" stuff just won't have the same BAM! anymore! Great recipe! I actually have had an aversion to canned salmon since I found a bone in my salmon about 3 months ago. I realize it's normal to fine tiny bones in canned salmon, but it really makes me nauseas. However, I like this idea for a recipe, and I may use it with canned tuna instead! I love tuna melts (an example of something I haven't made in a while), so homemade tuna burgers sound like a GREAT idea! I haven't really salmon cakes before. I had crab cakes, but that was pretty much it. I've got to try this out. I've seen several people make salmon cakes, then I see your...i guess this means I have to make them, too. Gina, I bought the wild, skinless, boneless Alaskan tuna from Trader Joe's. There were no bones and no skin, but I may have just gotten lucky... Tuna burgers sound great! I've never had salmon cakes before but I am sure they would be tasty. oooh those look yummy!! I've never had a salmon cake, or salmon from a can, or wasabi mayo!! I may need to add to to my 'must-try' list!!! I haven't made Greek feta Chicken in a while... or really any of my recipes from Kitchen Parade- the first website I tapped (a lot) for recipes... i must dig them out! LOOOVE wasabi mayo! They actually sell them in tubes in Japanese markets. 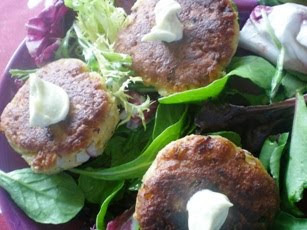 And those salmon cakes look GOOOD! I saw your twitter and was anticipating the photos and they sure didn't disappoint. Wow. This recipe looks great. Perfect to make a big batch and store in the frezer to make quick and healthy meals with. Mmmm those sound delicious! I'll have to try your recipe one of these days. I can't ever follow a recipe either! :P I try oh so very hard. 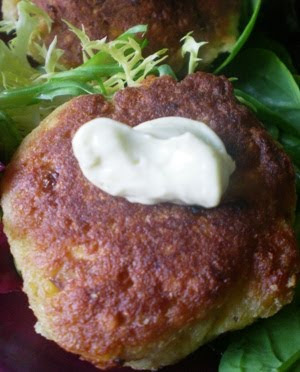 The salmon cakes look amazing especially with the wasabi mayo - how delicious! I've wanted to try to make crab cakes, but it always seems like too much work. Salmon cakes is ingenious! It takes out all that troublesome shelling. 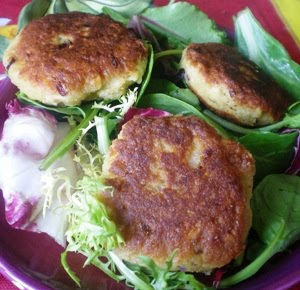 What a tasty easy alternative to the crab cake! Yum!